The Godfather of Gothic Rock made the unlucky thirteenth stop on his tour of the East Coast, with eight more North American towns to go before heading overseas for another 20 cities in Europe, and then returning to the states to perform at 12 West Coast venues. The theme was to perform mostly Bauhaus material with a few other songs thrown in for variety, thus the title, “Mr. Moonlight Tour.” Bauhaus broke up in 1983, splitting into Peter Murphy, solo-vocalist and Love & Rockets, composed of all the other members. Certain remarks PM has made over the years have suggested that he considers his ongoing solo project to represent the continuation of Bauhaus. Most would agree that L & R, has spun further off from the original style than has Murphy. Rare reunion tours occurred in1998 and 2006, and Bauhaus even reunited to produce a proclaimed “final” album, “Go Away White,” in 2008. The reunion performances, with the full complement of Bauhaus original musicians have been rightly acclaimed to be spectacular. 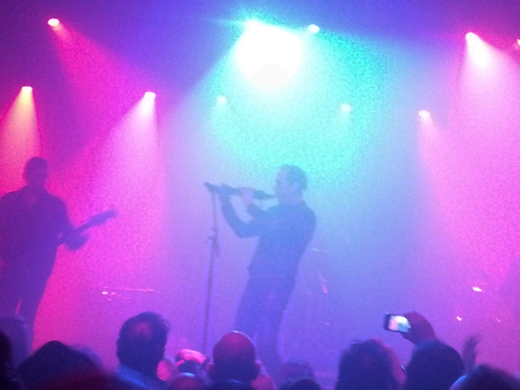 This tour however follows a different plan, with vocalist Peter Murphy being the only representative from the original band, backed now by studio accompanists. That arrangement seems to have fallen short of the standard set by the original line-up. The intense pastel lighting in concentrated hues of magenta, indigo and lime combined with heavy stage fog made the musicians appear as ghostly silhouettes much of the time. Sometimes the lights went down altogether, and PM lurked, with a very bright diode flashlight in hand, from the bassist to the guitarist to his own face, dramatically highlighting and distorting their features with stark white light and deep bizarre shadows. Poor audio quality and painful feedback detracted further from what was already a mediocre delivery. Many of these songs bore little resemblance to the original Bauhaus favorites owing to an overly bombastic instrumental accompaniment that drowned out the melodies and overwhelmed PM’s obviously under-performing vocals. Whether it was allergies, a cold or fatigue, PM’s voice was hoarse and weak, although intermittently redeemed by his sheer courage and supreme effort. Despite not feeling well and the announcement of passing of his mother-in-law earlier the same day, PM held little back as he performed his unique and signature gothic ballet on stage, bowing low, flapping his arms as if some kind of soaring bird of prey or prancing around with one hand on hip and elbow jutting provocatively. While this was not the best performance ever of either Peter Murphy or the Bauhaus oeuvre, it stands as a heroic recapitulation of one of the cornerstones of our musical and cultural era, a celebration and a statement of the Gothic and the punk underground subculture that arose in the early 80s and overturned all the rules of rhythm and melody, and, by extension, of style, fashion and even behavior that are so discussed, analyzed and dissected today. 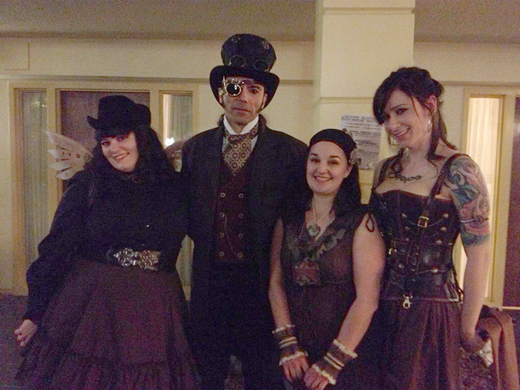 The Steampunk World’s Fair was held the weekend of May 17, 18 and 19 in Piscataway NJ and drew a crowd of participants large enough to fill two adjacent hotels – Embassy Suites and the Radisson – and any number of surrounding motels in the area. 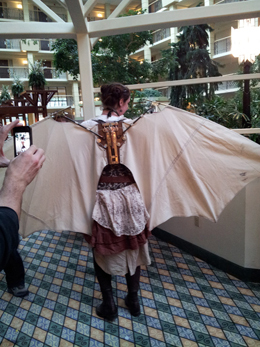 Steampunk, whether or not it remains under the mainstream radar, is huge. It is huge in the following it attracts and huge in the level of zeal of its fans. It is also almost boundless in the concepts and interests it encompasses. Steampunk, for those who have yet to become familiar with the term, is an elaborate branch of geekdom, that derives its main inspiration from the unfulfilled science fiction of the past. The writings of Jules Verne (1828 – 1905) are seminal, with recurring themes drawn from “Journey To The Center Of The Earth,” “Around the World In Eighty Days” and “Twenty-Thousand Leagues Under The Sea.” Thus, airships, blimps, balloons as well as diving gear, giant squids and octopi have a revered place in the aesthetic of Steampunk. The retro-futuristic angle of Steampunk owes a great deal to H.G. Wells (1866 – 1946) whose book “The Time Machine” introduces the concept of time-travel, putting that notion at the disposal of Steampunks who imagine an escape, both backwards into the 19th century and forwards into the distant future of technology. The event took place at those two adjacent hotels, with the large, paved space in between them serving as a “midway” on which were hoisted large tents for vendors and exhibitors, called The Goblin Market, as well as huge performance and gathering spaces. Merchandise stands hawked incredibly creative artworks, personal adornments and home or office furnishings which featured the signature style of Steampunk, namely faux-antique, improbably engineered contraptions with elaborate mechanisms, featuring gears and sprockets, such as ray-guns, submarines, airships and deep-sea creatures. 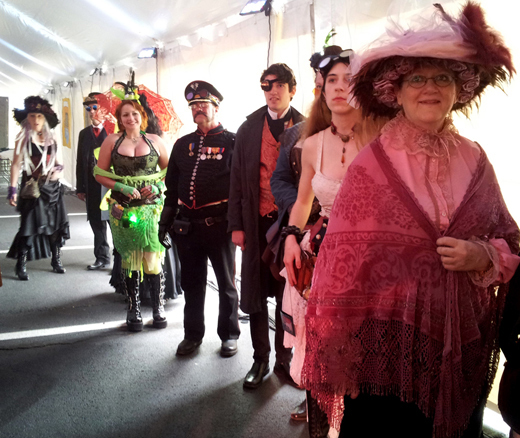 Likewise, the street level suites in both hotels were filled with vendors selling such Steampunk necessities as walking sticks, corsets, top hats and brass-accented jewelry. Events took place day and night, including a fashion show wherein convention-goers who chose to do so could display their often wildly individualistic, yet always thematic costumes, attired like characters in an R-rated version of Willy Wonka-meets-Game of Thrones. There were burlesque shows with unconventionally large female and uninhibited male strippers; fire-jugglers; a workshop on Bartitsu (walking-stick self-defense); ballroom dancing lessons, etc. There was an absinthe-tasting event hosted by Goth celebrity Voltaire, whose wit remained dry despite swigs of rum between samples of the absinthe, and who performed his sarcastically-worded anti-folk favorites solo at a midnight show accompanying himself on a guitar. Music was everywhere, interesting and genre-bending. Emperor Norton’s Stationary Marching Band captured an outdoor audience with their rambunctious blend of brass, wind, string, accordion and drum performance featuring an occasional lapse into acrobatics by vagabond-attired but highly accomplished musicians. 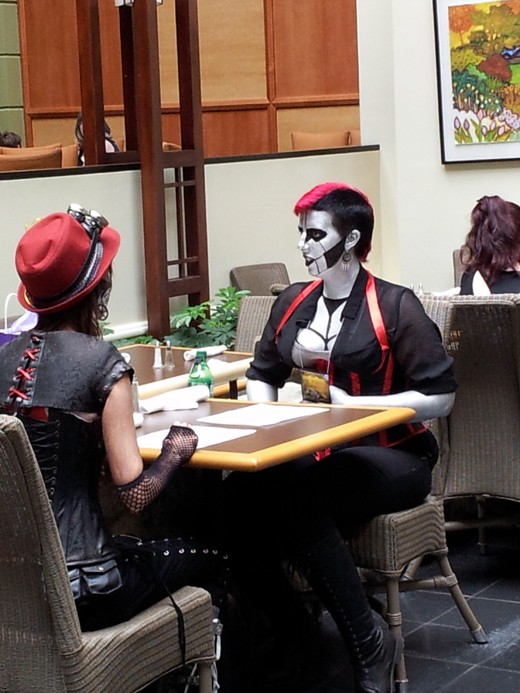 A totally fascinating show was put on by San Diego-based combo Steam Powered Giraffe, a bizarre musical group that accompanied their very interesting and listenable songs with robotic affectations, wearing metal-face make-up and performing comic routines in a manner reminiscent of Blue Man Group. An electric cellist performed on the mainstage and offered 17 hours of her music for sale on a USB storage device. A beautiful female vocalist from the duo Frenchy & The Punk was accompanied by a young man who set new standards for mastery of the guitar. Just as this account barely scratches the surface of musical acts at the Fair, the rest of this review comes nowhere near cataloging the imaginative and exhausting diversity of events and ongoing exhibits at kiosks, tables and concession stands or the assortment of individuals just wandering the grounds displaying their outlandish costume or hand-manufactured thingamajig. 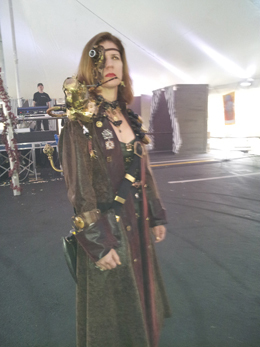 It is impossible to set the boundaries of Steampunk at this time. The movement includes so many tributaries including historical re-enactment, eccentric musical styles, costumery, 19th century literature, sci-fi, fantasy and interests ranging from the low-tech, high design age of steam to Victorian parlor games, that it is beyond the scope of this report or any attempt to tie it all together. 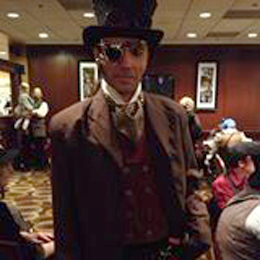 It is easier to compare Steampunk to the general category of geek interests —such as devotion to comic books, anime, computer games, role-playing, etc.—rather than to define it in its entirety. 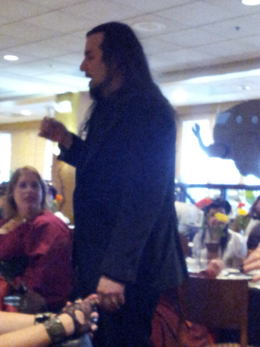 In fact I observed evidence that there were elements of overlap among these various subcultures. Its adherents are generally intellectual, intensely and obsessively committed devotees who are unwilling to settle for plain, vanilla reality, so instead avail themselves of this alternate world with all its fantasy identities, aesthetics, ideology and mutual self-acceptance. 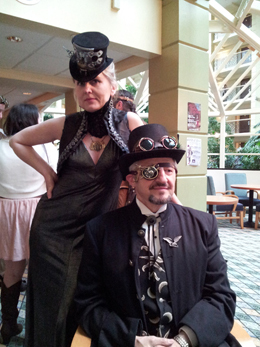 Bravo to the organizer, Jeff Mach and minions for putting this all together for the Steampunk Worlds Fair 2013!